Welcome to the Firefly Farm website. Please take a few minutes to check it out; we hope you enjoy your visit! Congratulations to 2013 ISCA National Amateur Champion Brophy's Riding High, owned by Dave & Vickie Tompkins. "Jerry Jeff" was born and bred at Firefly farm and sired by Firefly's Solid Dollar. 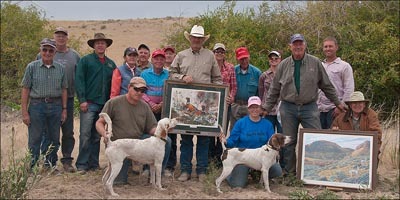 Full Force Buck wins 2012 Region 9 Amateur Shooting Dog Championship at American Falls, ID in September. Thank you judges June & Larry McConnell! Thanks also to the Region 9 Club, especially Doug & Lillian Favor, Glen Wiese, Harold Chadwick and Tim Fullerton for hosting the event. Copy write 2014-2015. All images and text are the property of Firefly Farm & Kennels. Do not copy, duplicate or use without express permission.